What if the Old Testament is a work of fiction, Jesus never existed, and Muhammad was a mobster? Although ostensibly about “gnostic wisdom,” authors Freke and Gandy in fact subject us to a bombastic parade of their own sophmoric religious opinions, the better part of which are devoted to either ridiculing the views of the “Literalists” (whom they consider hopelessly benighted), or delighting in the self-styled sophistication of their own tailor-made “gnostic” system (which, by my evaluation, in fact has very little to do with historic gnosticism, and very much to do with late modern post-Christian spiritualism). Indeed, they fall into the trap of many American and modern new religious philosophies, which proclaim as “perennial” something that is in fact very peculiar and particular to the religious sensibilities of the liberal, urbane, postmodern sophisticate — a person all but completely unmoored to the traditional coherence of a historic community of faith. Freke and Gandy at least want to identify something worth saving from the religion of old: the whole book is structured around an attempt to distinguish between the proverbial “baby” of gnostic spirituality and the “bathwater” of literalist religion. This is a legitimate heuristic for persons at a particular stage of spiritual development: for those responding to the trauma of dysfunctional religious communities, wherein abuse was justified and perpetuated with appeal to religious symbols, such differentiation can be an important step. As a globalizing interpretation of religion as a whole, however, I fail to see how this kind of dichotomy is helpful, and doesn’t in fact end up collapse into a hypocrisy of the worst kind. Among their many charges against “Literalist religion,” for instance, Freke and Gandy say that it locks us into an “us” versus “them” mindset. Yet is this not to commit the same evil just condemned? — now the “us” are a sophisticated spiritual elite who — being spiritually “awakened” — don’t take our faiths-of-origin too seriously; the “them” the “unwashed” masses of people “trapped” within a literalistic religious framework. The dichotomy is all the more pernicious for being utterly incapable of processing the fact that for many people, “literalistic” religion is a profound source of life and joy that should be celebrated within the diversity of human experience, not demeaned and destroyed. While tools are needed for diagnosing and treating malignant forms of religiosity, they need to be much more carefully constructive. 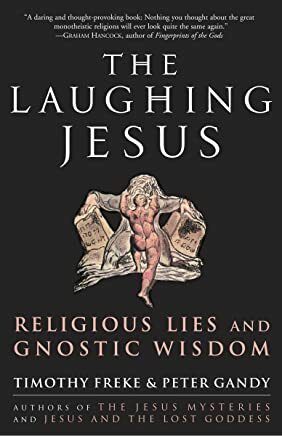 “The Laughing Jesus” can commend itself to our collection in that it is certainly an “alternative view” of the Abrahamic metanarrative; and although I myself take it to be an especially poorly conceived and poorly constructed alternative, it may be the alternative someone is looking for, and right for them within a particular stage of their spiritual journey. All faults notwithstanding, Freke and Gandy are actually not that far behind the curve of scholarship when it comes to the mildly iconoclastic “pop-gnosticism” of scholars like Elaine Pagels and Karen King, but depart from them chiefly in being even more bald and unrestrained in lambasting traditional orthodoxy. I should like such lambasting to be more thoughtful and more effective, but it is certainly permitted, even in its less articulate form — especially within the nimbus of “alternativity”.